The earthquake that struck Haiti on January 12, 2010 forever changed the nation of Haiti, and severely damaged the Grace Children's Hospital campus. The hospital has rebuilt transitional facilities that continue to serve the people of Haiti, and have new outreaches to the tent communities near the hospital. Even in the aftermath of the earthquake, hospital operations were only halted for a few days, and care for the children staying at the hospital never ceased. You Can Save a Child’s Life: Become a Partner in Grace Today! The staff members at Grace Children’s Hospital care for hundreds of children a year at the hospital’s inpatient ward. During their stay, which averages three months, Grace Children’s Hospital provides a place of healing and solace to these suffering children. The children receive excellent medical care from professional doctors and nurses, nutritious meals to help them grow healthy and strong, and comfort from the dedicated and loving mamans (nurses’ aides). Once a child is on the road to recovery, he or she can also attend school at the hospital. For some, this is the first and only time they will ever experience a formal education. Families receive all of these services for a one-time fee of $8 USD, yet so many cannot afford even this much. Grace never turns a child or family away regardless of ability to pay. In Haiti, affordable health services for both children and adults are hard to come by. In response to this, International Child Care has offered outpatient clinics at Grace Children’s Hospital in Port-au-Prince since the mid-1970s. The clinics provide diagnosis and treatment for diseases like TB and HIV, as well as offering preventative health care like eye exams and vaccinations. The hospital pharmacy fills prescriptions on-site so patients can go home that day with the necessary medicines. As with all of Grace Children’s Hospital’s programs, fees for outpatient services are determined by a sliding scale based on the patient’s income. No one is ever turned away because they are unable to pay. 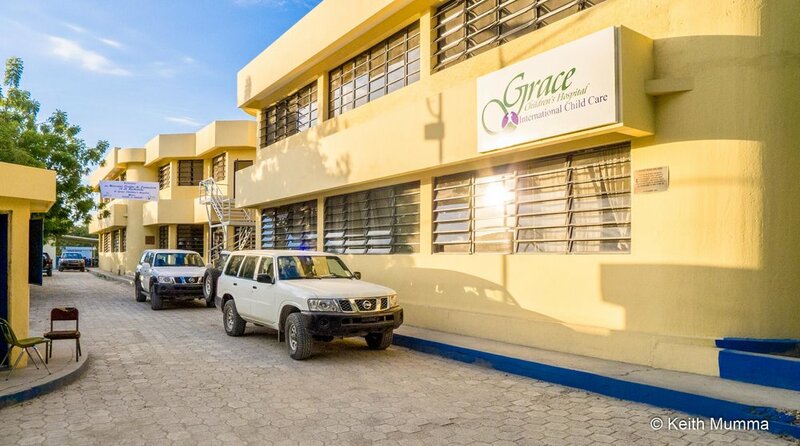 Urban Community Health is an outreach program of Grace Children’s Hospital that brings primary health care and education to residents of Port-au-Prince right in their own neighborhoods, as well as in the tent cities. Working alongside the people in the community, International Child Care has achieved impressive results by linking community-based health promotion and illness prevention with hospital and clinic-based care.